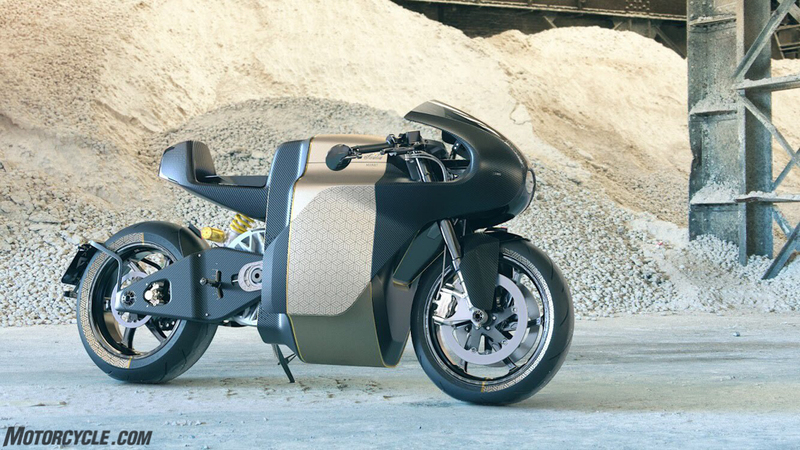 The major bane of every electric motorcycle’s existence, at least so far, is weight. As battery technology stands these days, there’s no getting around the fact that batteries are heavy. No matter how many trick components you surround the battery with, a plump curb weight is a killer when it comes to performance. Case in point, the Energica Eva Esse Esse 9. A trellis frame, Marzocchi fork, Bitubo shock, OZ wheels, Brembo brakes, and the finest in Italian electric motorcycle technology can’t hide the fact that the bike weighs 621 pounds. Contrast that with this, the Saroléa Manx7. 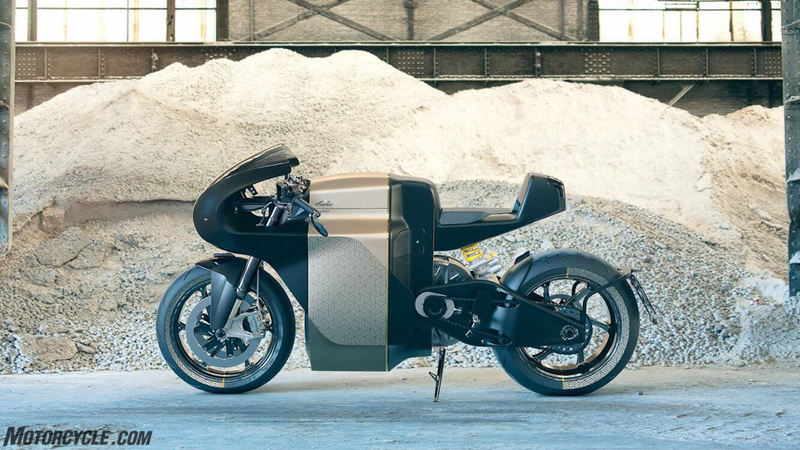 Born out of Belgium, Saroléa developed a pure racebike, the SP7, to contest the Isle of Man TT Zero race for electric motorcycles. Technical difficulties meant the team came short of their goals, which is too bad since rider Dean Harrison was on fire all week. Nonetheless, the lessons learned from the SP7 filtered directly over to the Manx7, and the first thing you notice about it is the styling. Like an old school grand prix racer reimagined for the modern day, the rounded nose/headlight combination and stubby tail visually takes you back in time. Meanwhile, the broad-shouldered mid-section gives the machine a visually muscular appearance – and the gold stripe down the middle is a nice touch. Look closer and you realize the Manx7 isn’t wearing matte black paint – that’s all carbon fiber. All of it, from the bodywork, to the monocoque frame – even the swingarm. And for the bits needing screws, titanium fasteners were used to keep weight down. Other components include Öhlins suspension, Beringer brakes, and forged wheels from OZ Racing. Add them all together, and the Manx7 is said to weigh a svelte (for an electric sportbike, anyway) 478 pounds. For comparison, we weighed a 2018 Aprilia RSV4 RF at 465 pounds with a full load of fuel. The Manx7 is clearly an engineering exercise for the guys at Saroléa, and while the weight is certainly impressive, shift your eyes toward the swingarm again and you may notice the end of the swingarm doesn’t have any sort of provision to adjust chain tension via moving the rear wheel fore or aft. You’ll also see the rear brake caliper sitting flush inside the swingarm. If you’re scratching your head then look at the motor – this is where you’ll find the provisions to move the motor back and forth. Yes, you adjust the chain from the motor side. You’ll also see degree marks for proper alignment. Okay, so what about power? Of course it has a ton of it. The Manx7 comes in three battery configurations: 14 kWh, 18 kWh, and 22 kWh, delivering a claimed range of 143 miles, 174 miles, and 205 miles, respectively. As for power, we’re talking 161 hp (120 kw) and 332 lb-ft (450 Nm) of torque! Only 20 Manx7 models are slated for 2018, so if you’re reading this for the first time you’re probably already too late to the game, assuming of course you have the cash for such a rare machine. So what is the cost, you ask? The 14 kWh model will set you back roughly $50,000 (€42.975), the 18 kWh version is $54,000 (€46.280), and the big daddy 22 kWh model is $57,000 (€48.760). Not cheap by any means, but also not astronomical considering the performance, components, and weight. Read more about the Manx7 at the Saroléa website.